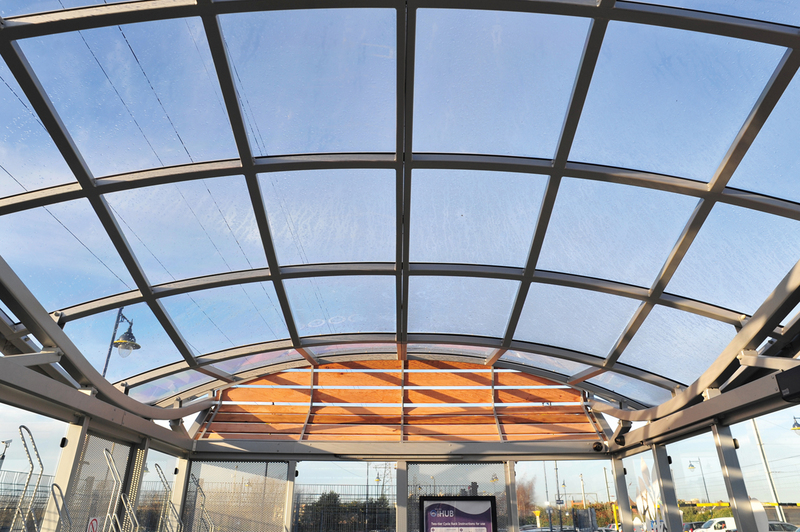 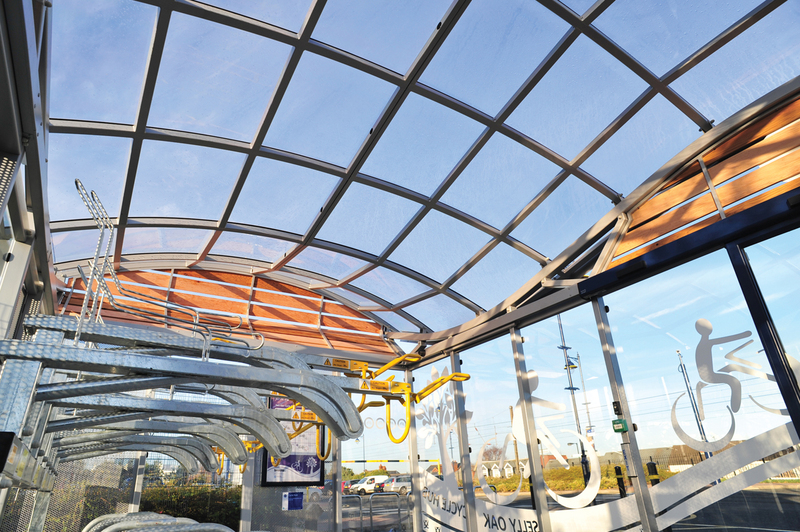 Centro is responsible for bus, rail and Midland Metro Tram transport in the West Midlands. 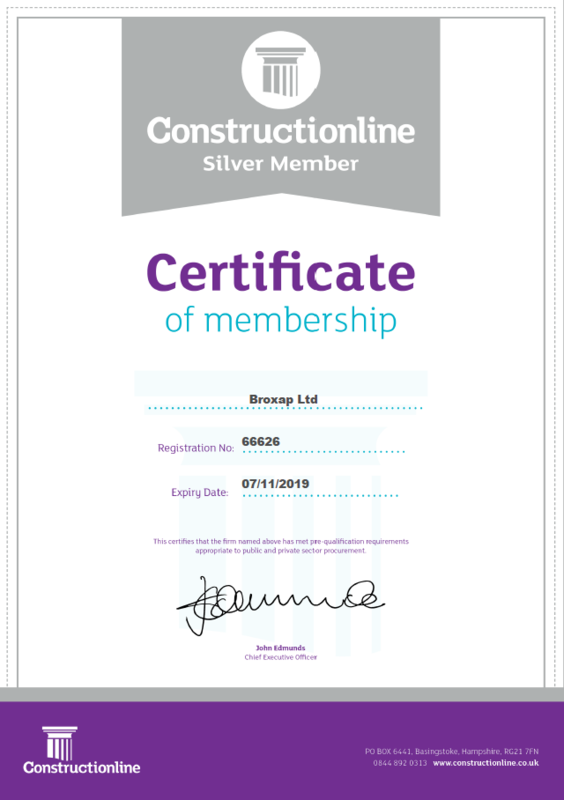 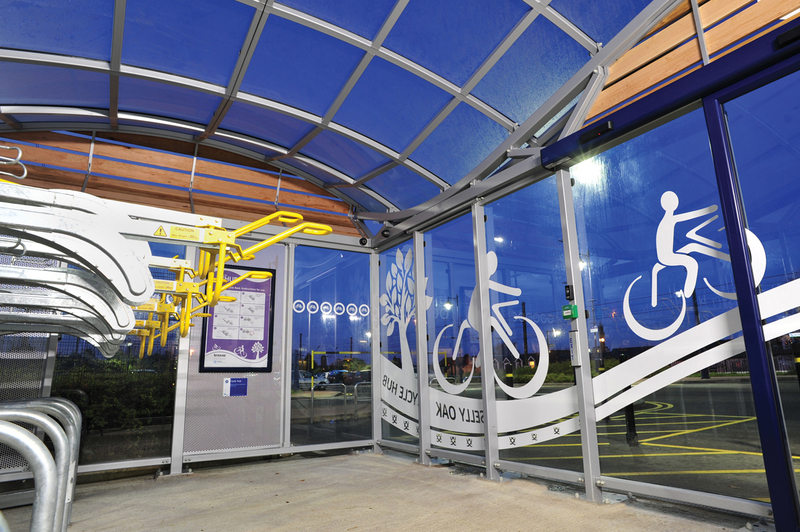 Their aim is to encourage and support walking and cycling where it forms parts of an overall public transport journey or provide an incentive to use public transport. 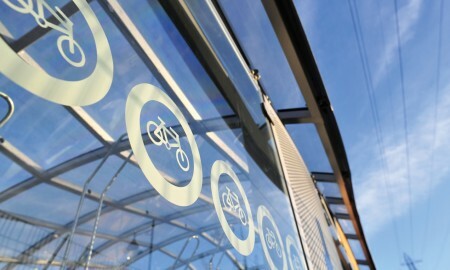 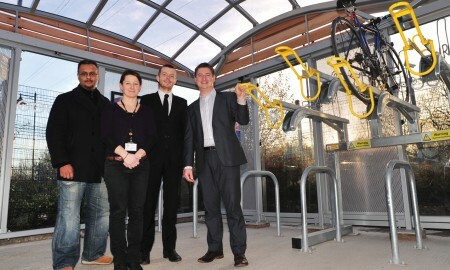 As part of their overall plan they wanted a pilot cycle hub to be located at Selly Oak railway station. 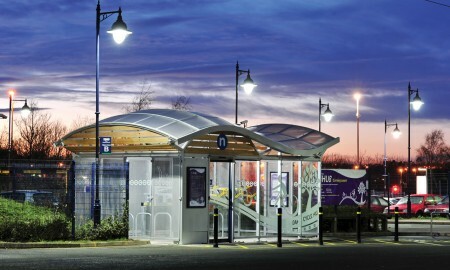 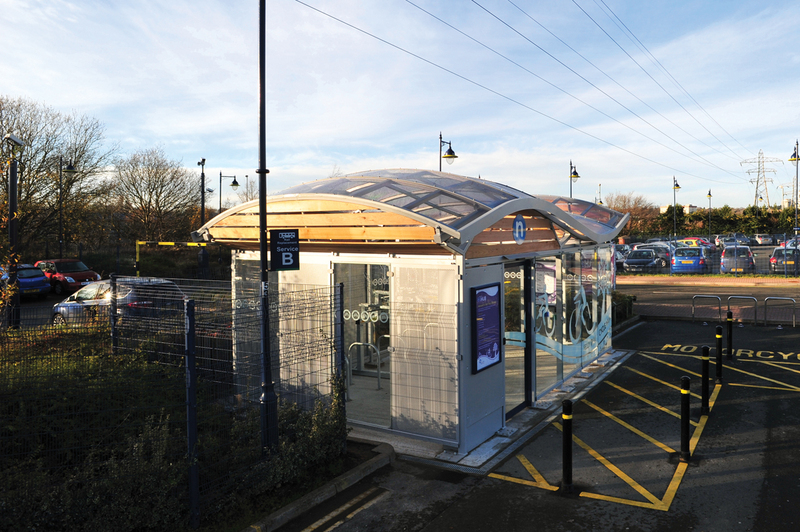 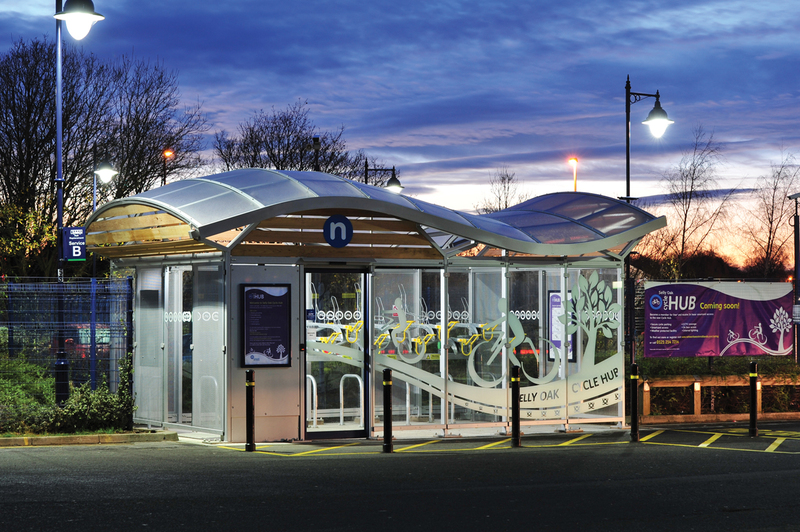 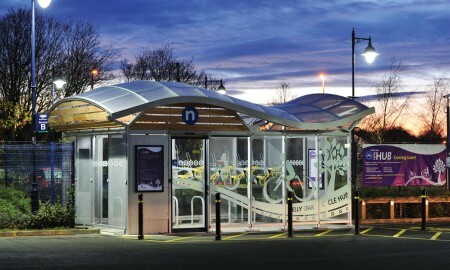 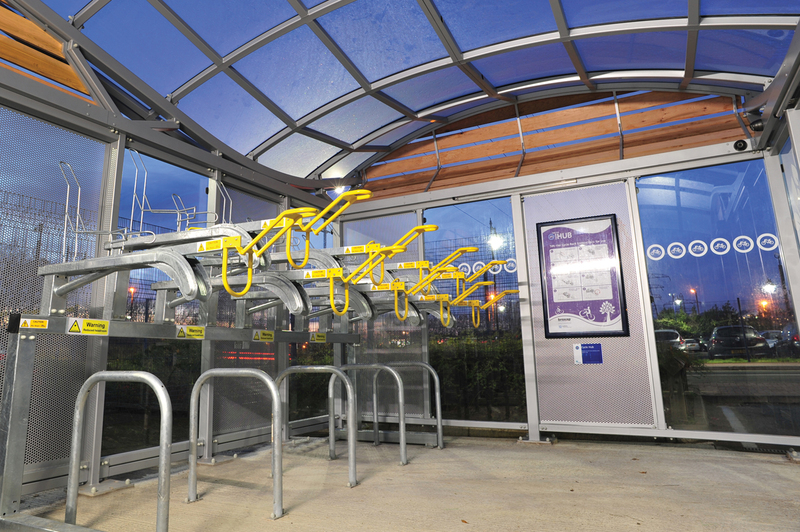 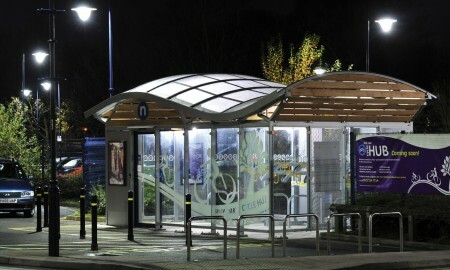 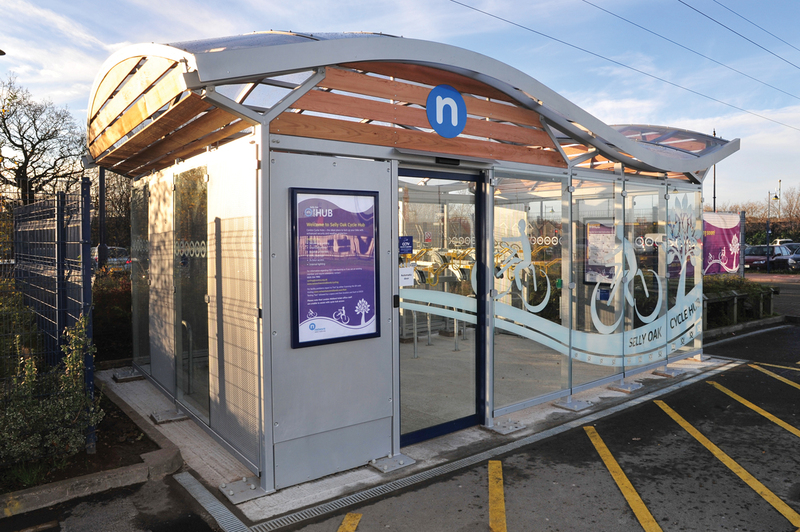 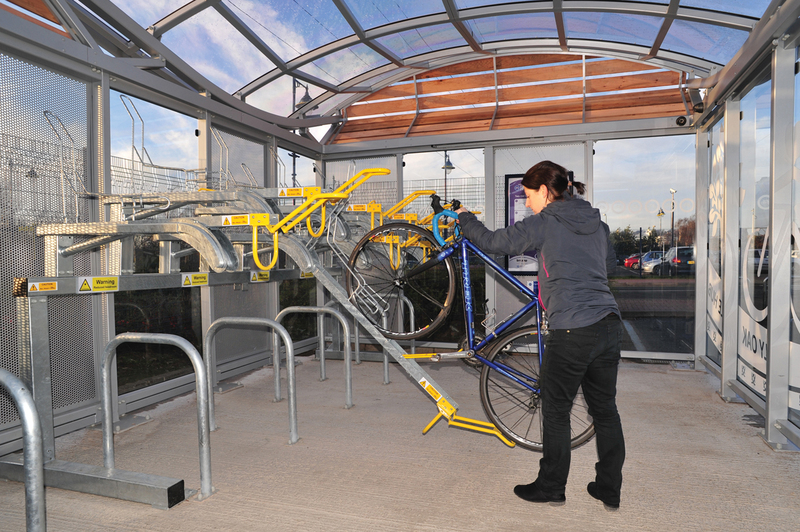 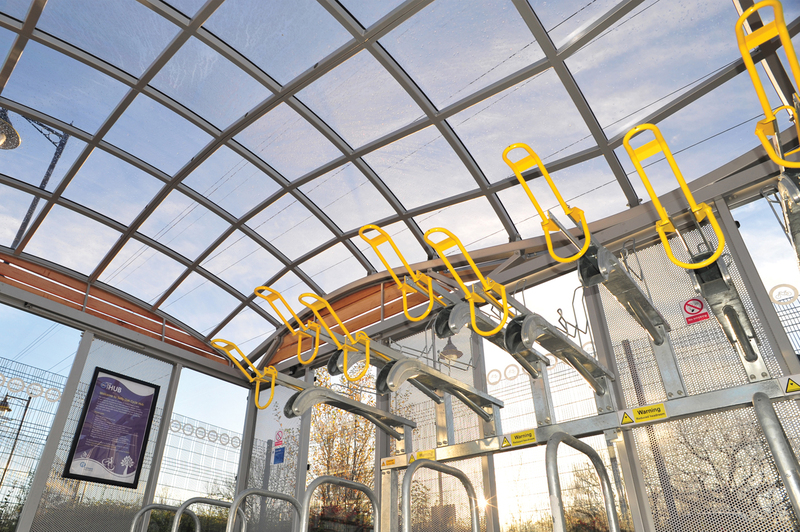 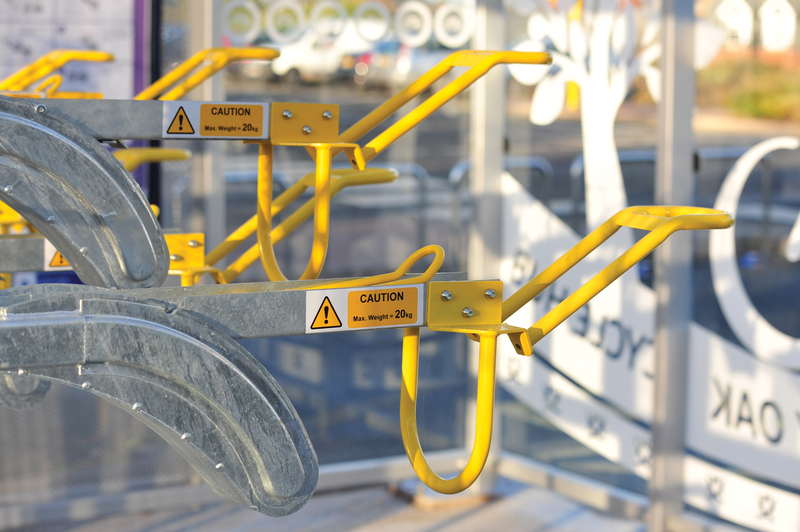 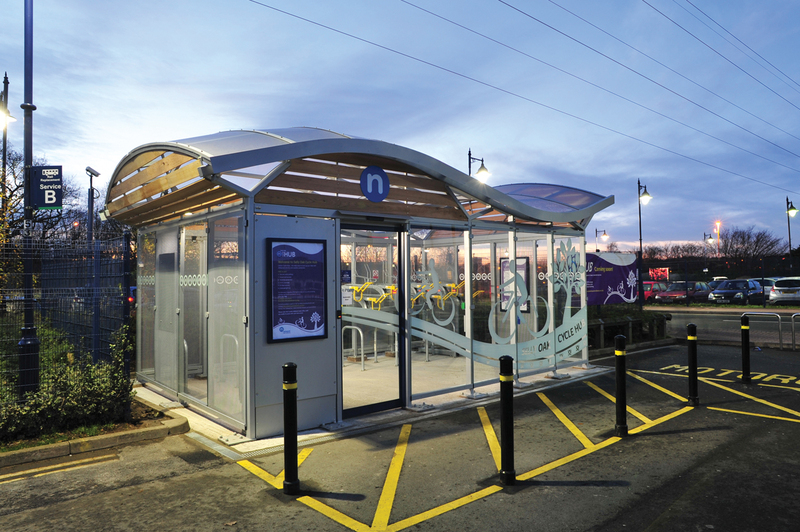 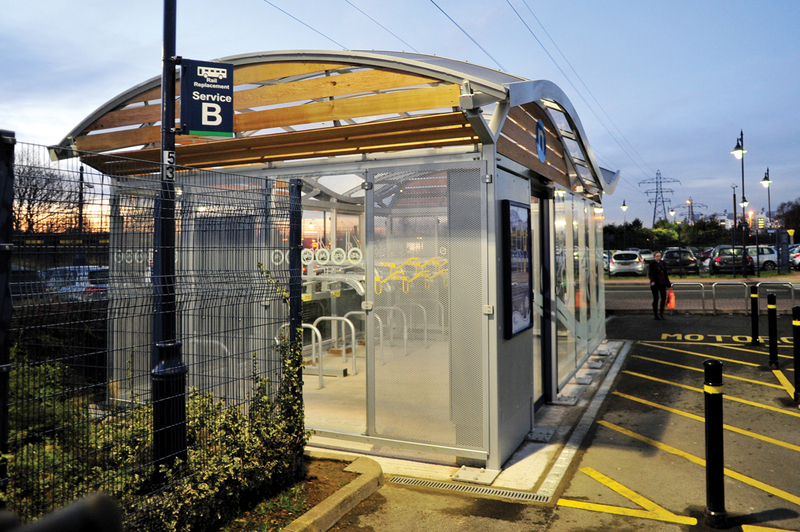 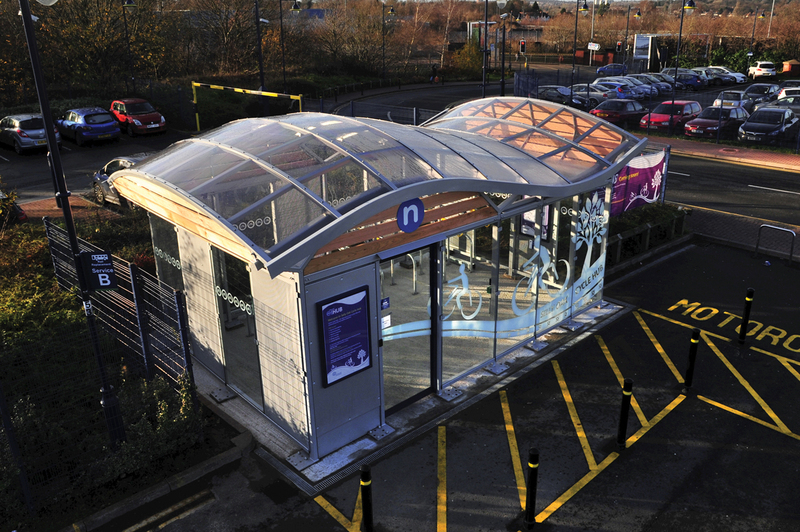 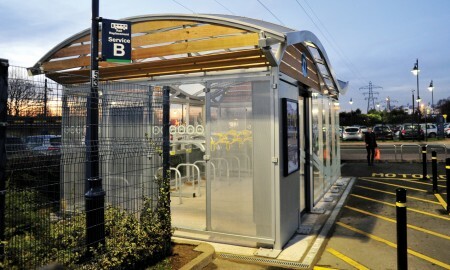 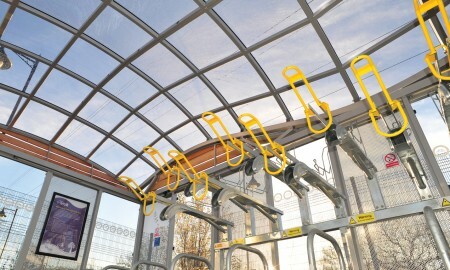 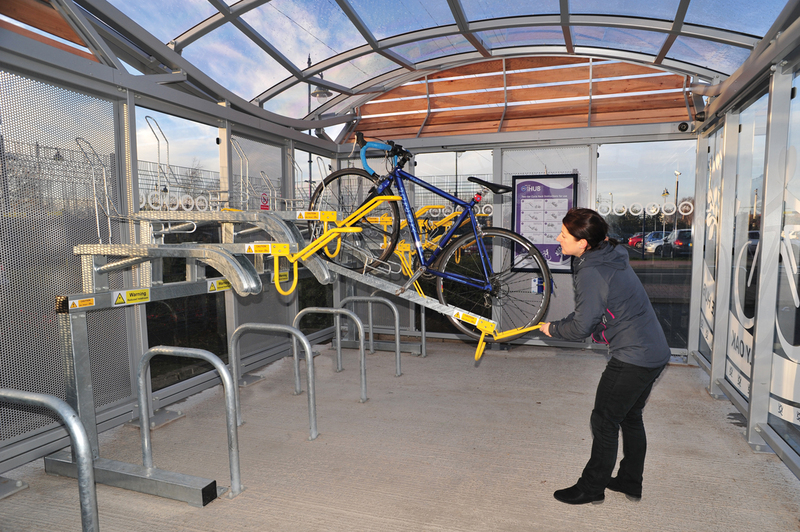 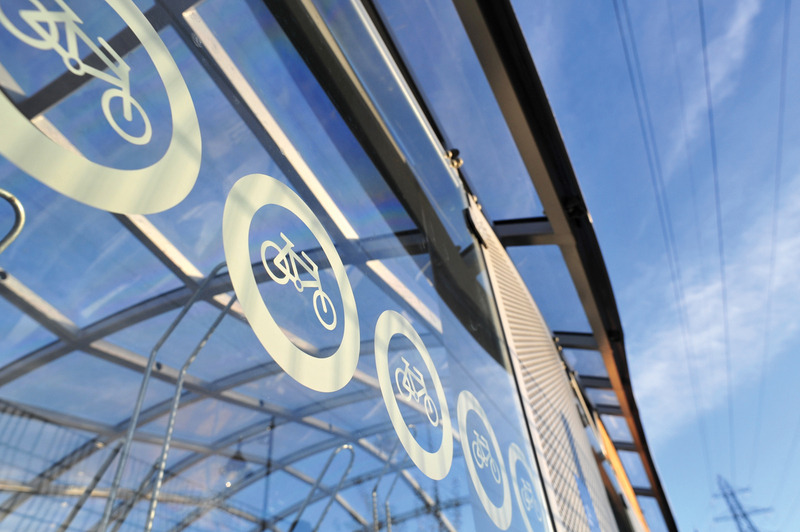 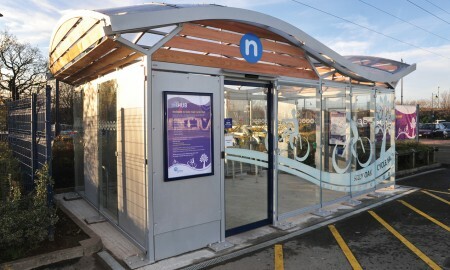 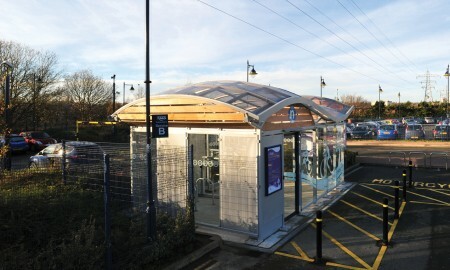 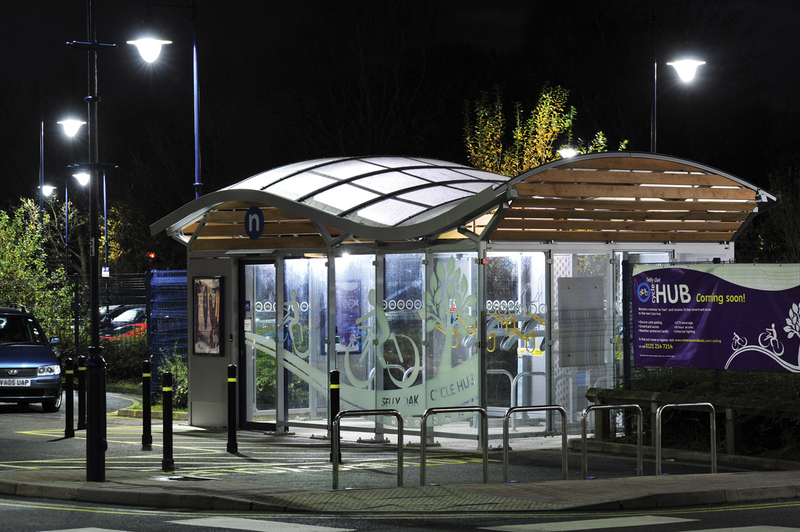 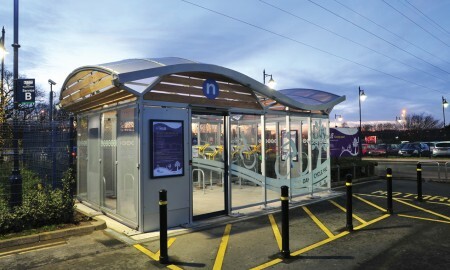 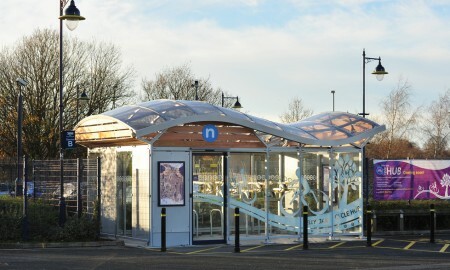 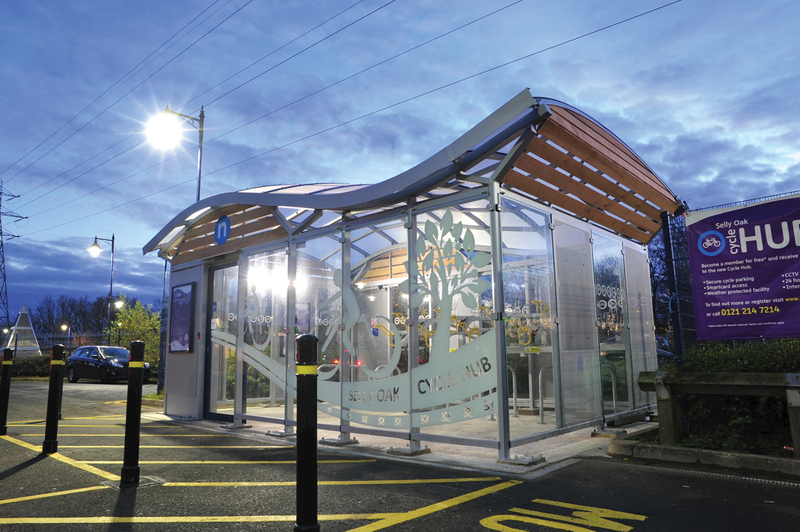 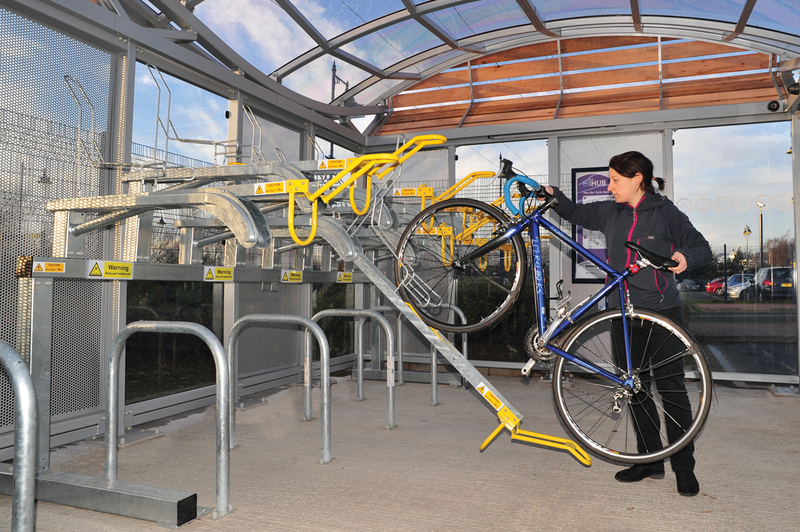 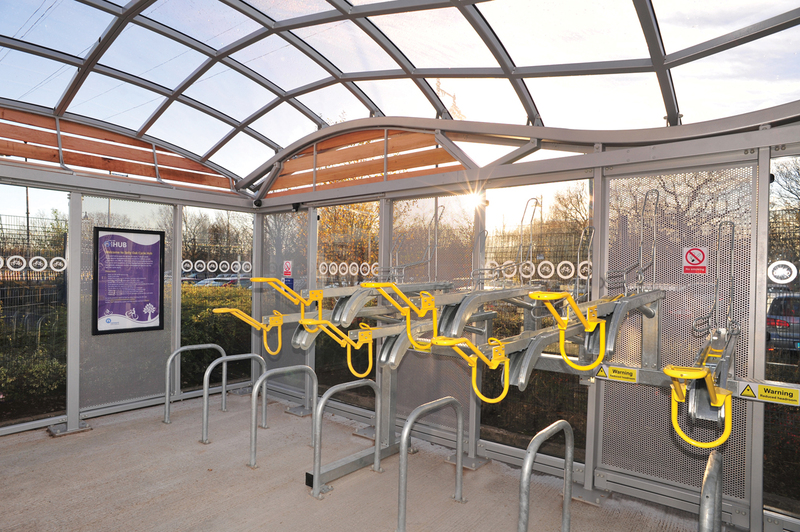 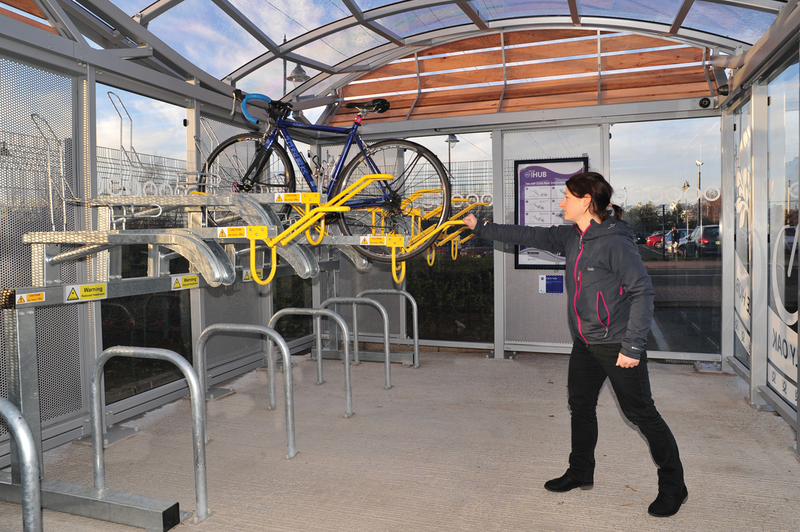 The staff at Centro came up with a concept design for a hub in which they envisaged would provide a step change in the quality of cycle storage at local stations. 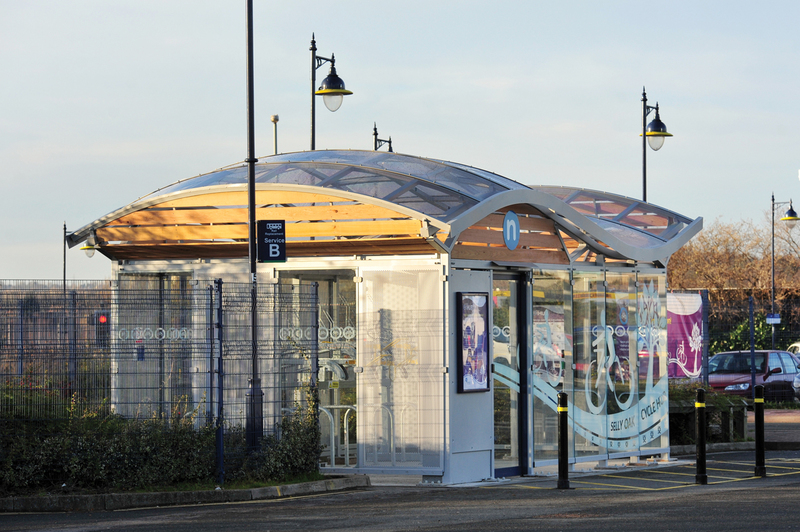 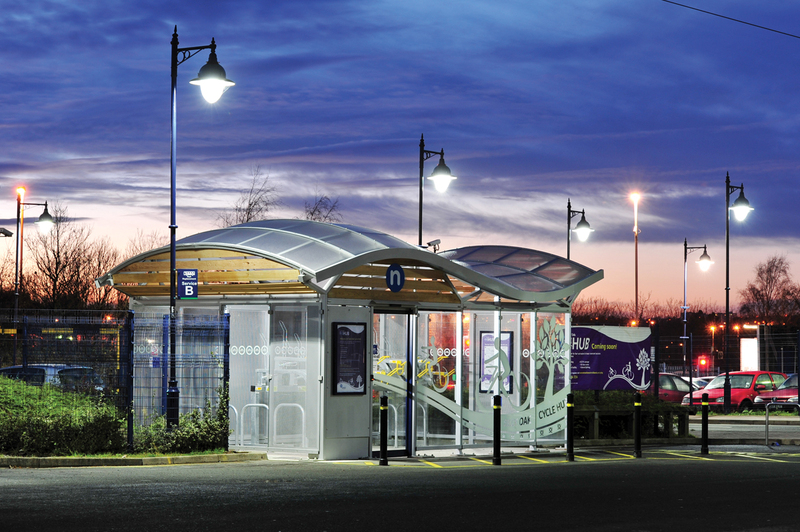 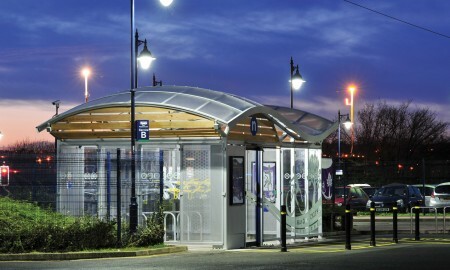 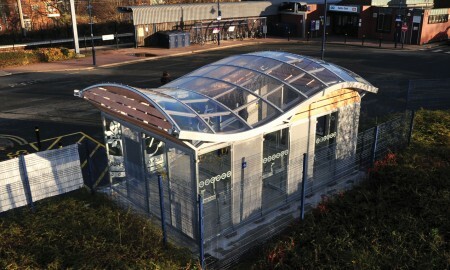 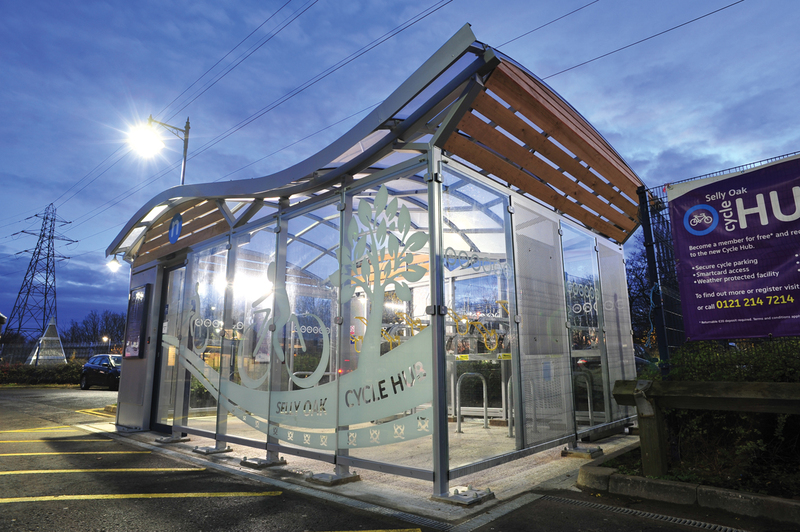 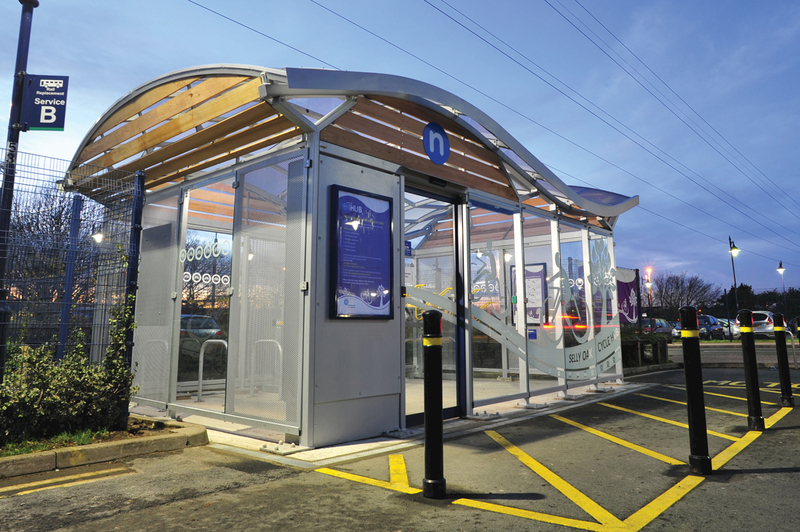 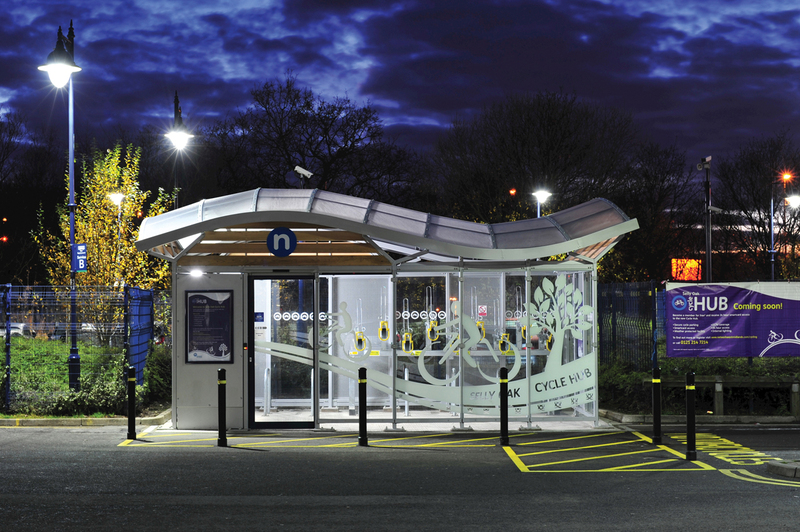 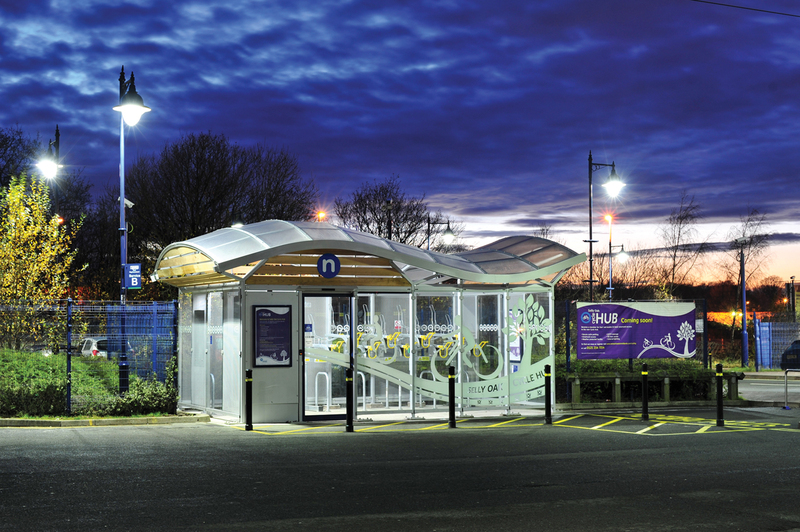 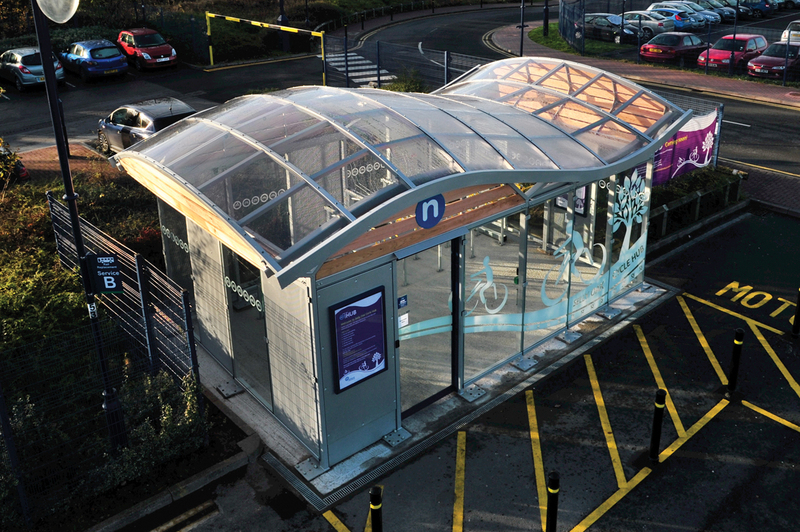 They were looking for a suitable contractor to supply and install a purpose built self-contained cycle storage facility, which was both iconic and distinctive. 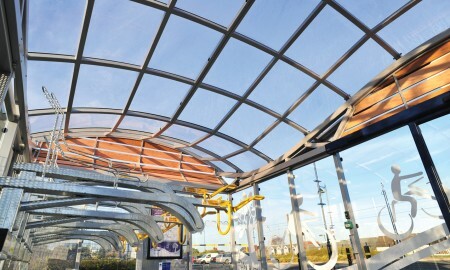 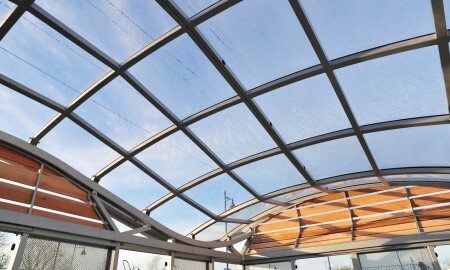 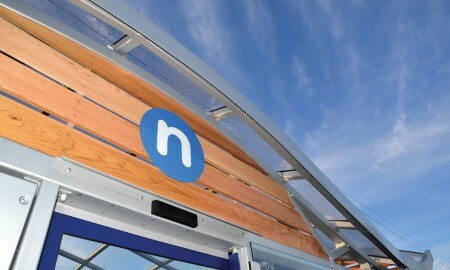 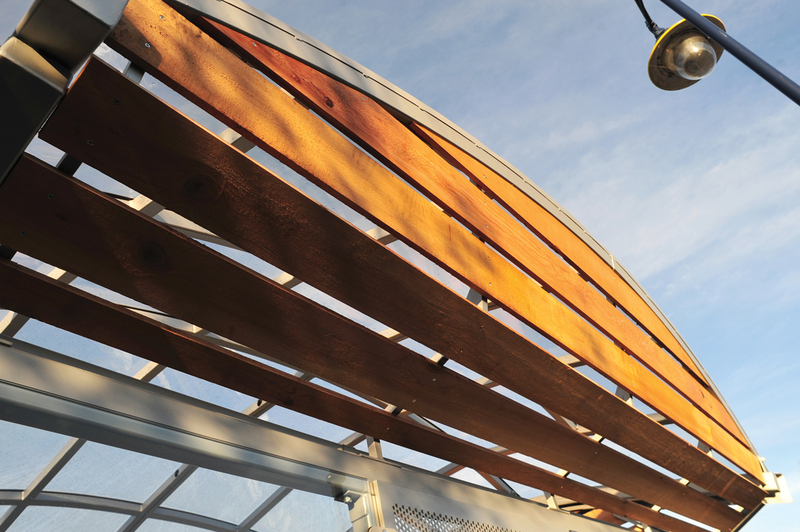 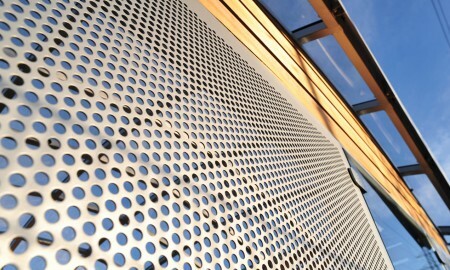 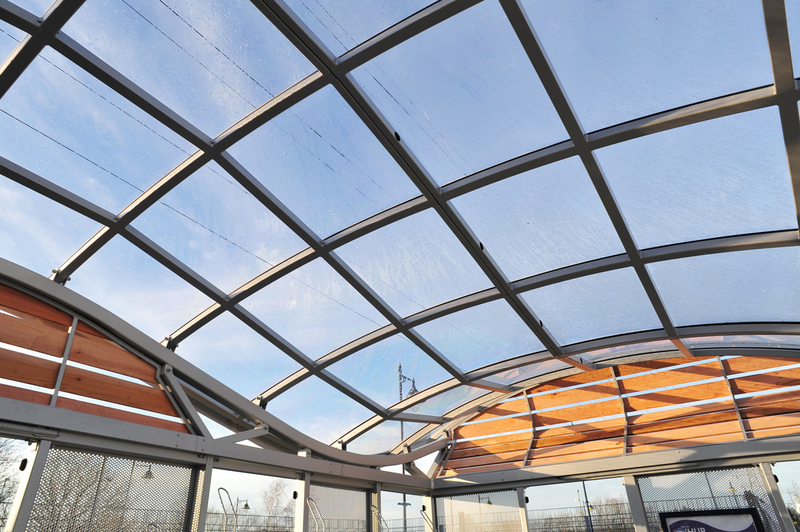 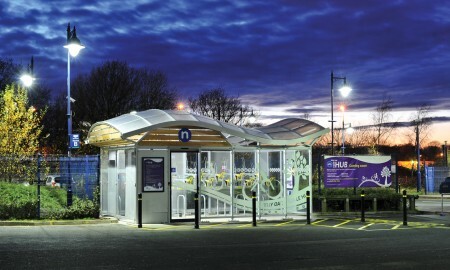 One of the key elements of the new hub was its roof, the roof itself gave the hub the ‘wow factor’ Centro required. 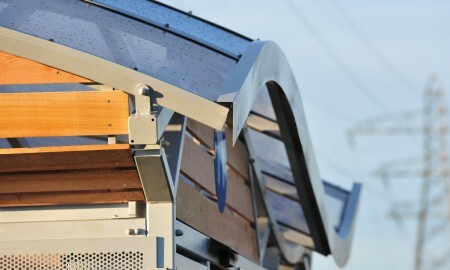 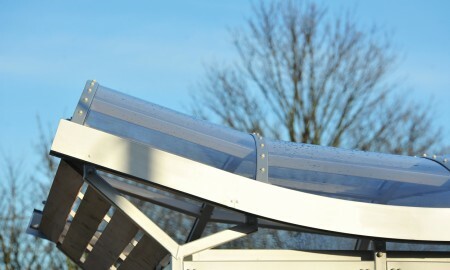 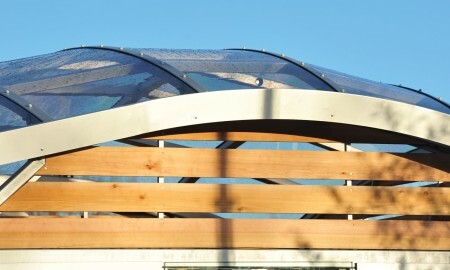 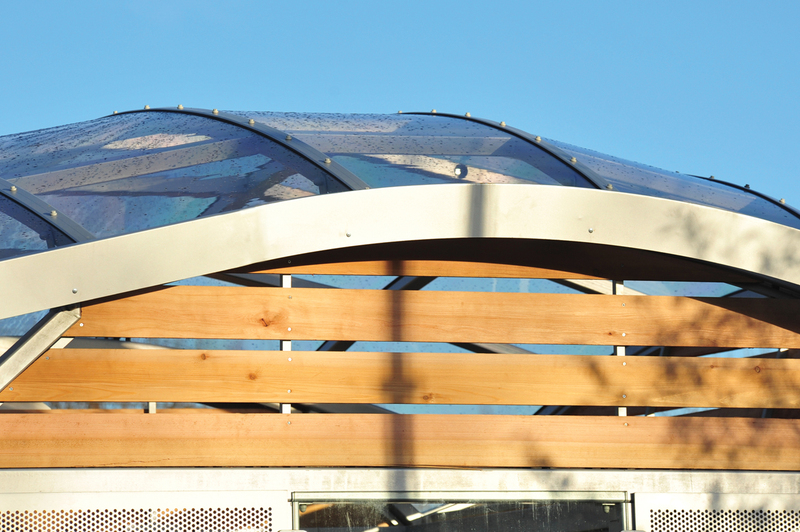 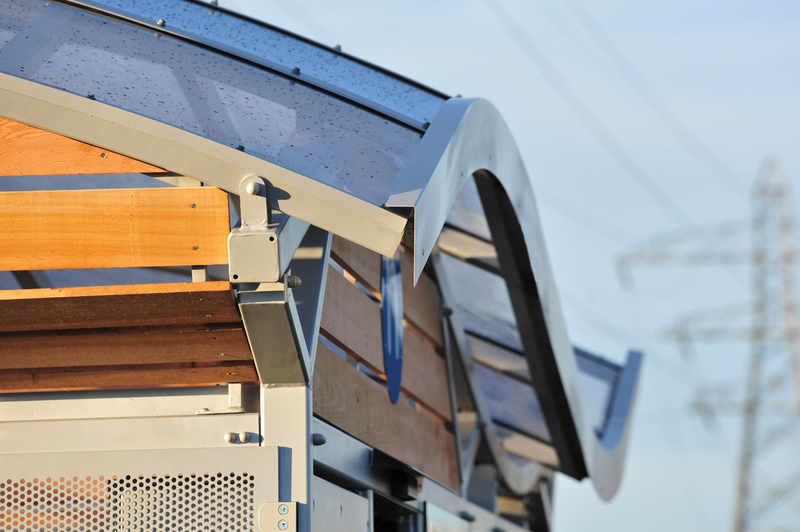 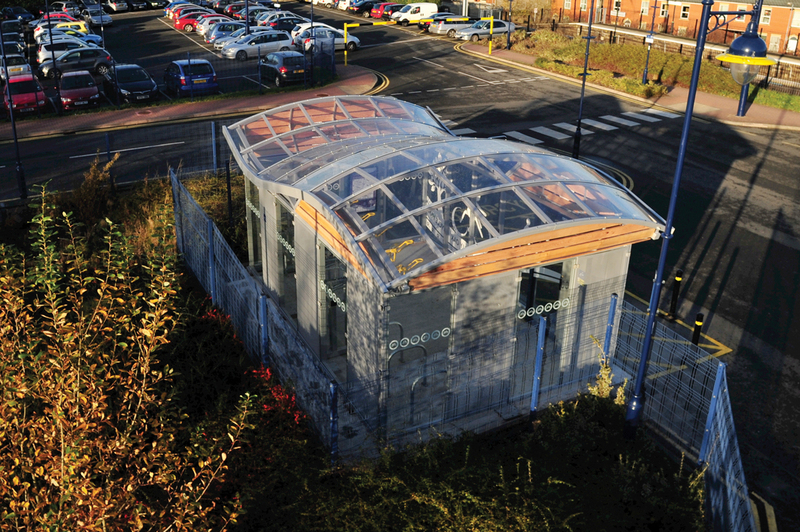 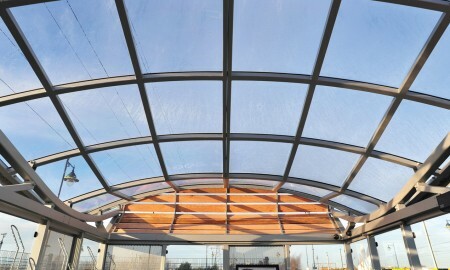 Although complex, the roof’s sinusoidal almost armadillo shell like appearance was a welcome challenge for our technical designers here at Broxap. 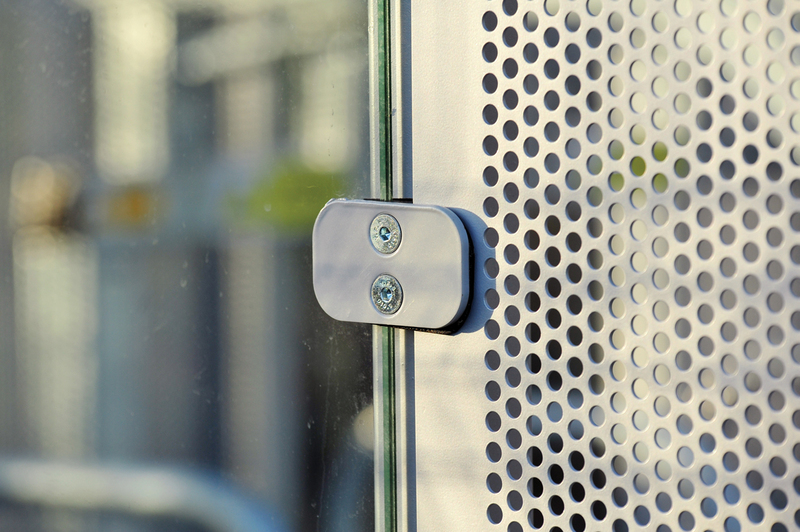 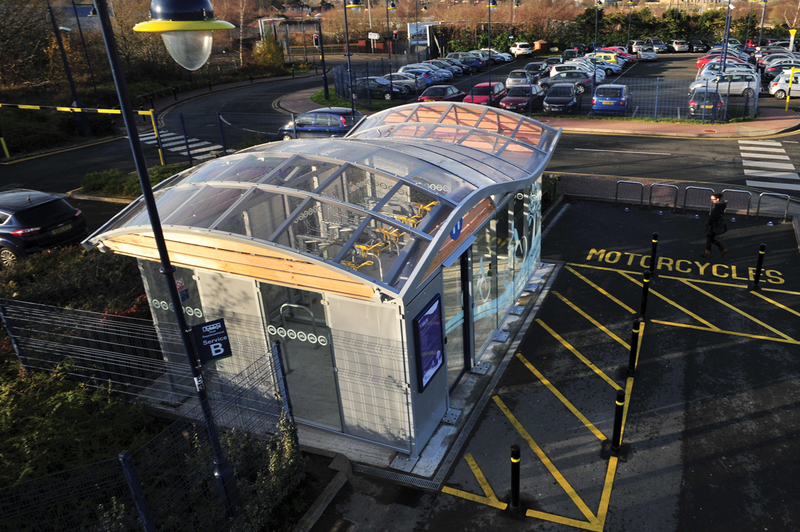 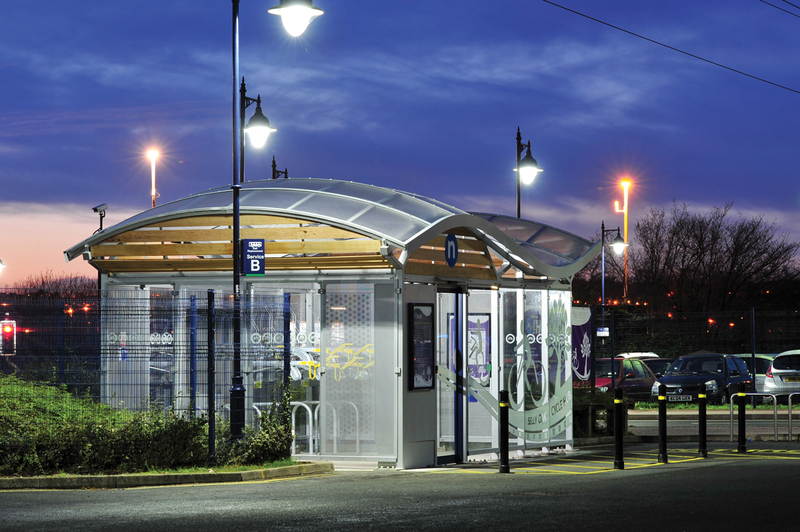 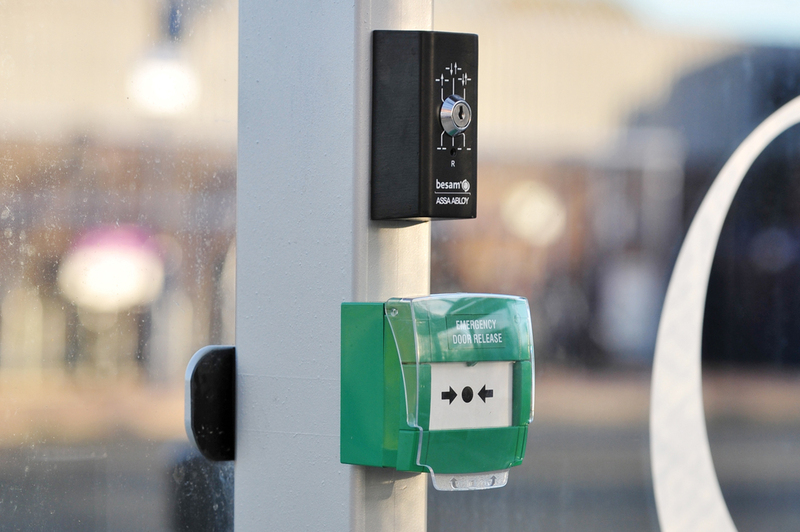 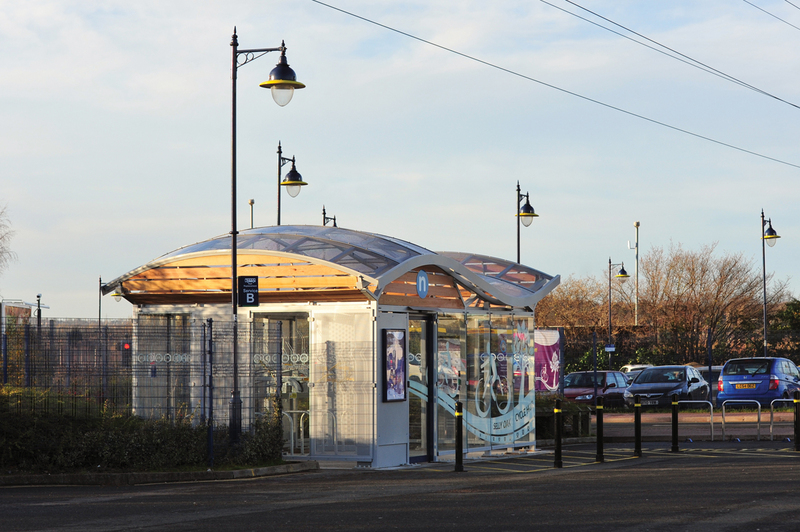 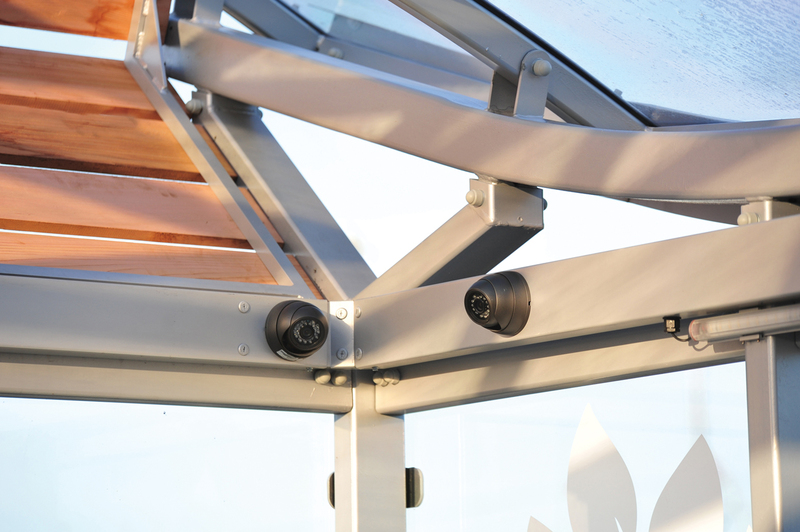 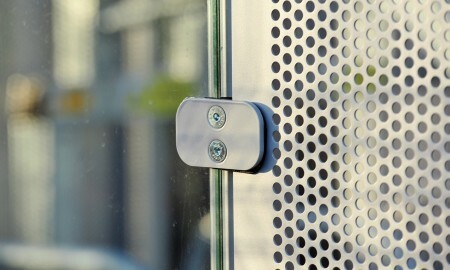 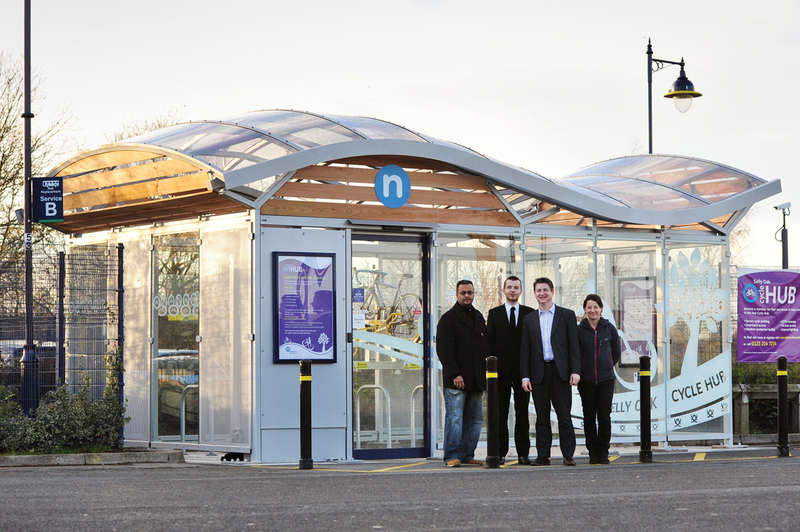 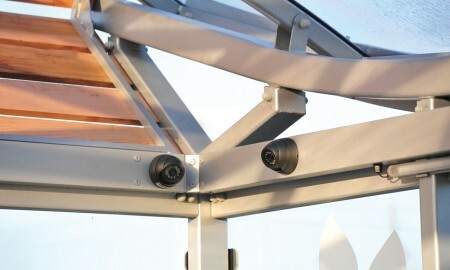 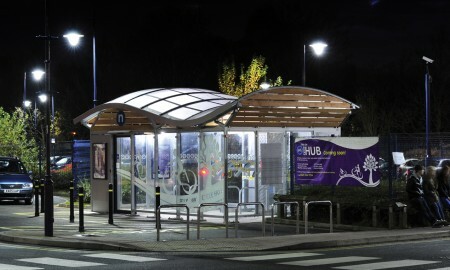 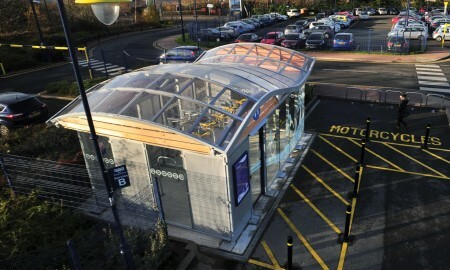 The hub had to be secure, weather protected and offer CCTV coverage, lighting and provide smartcard access. 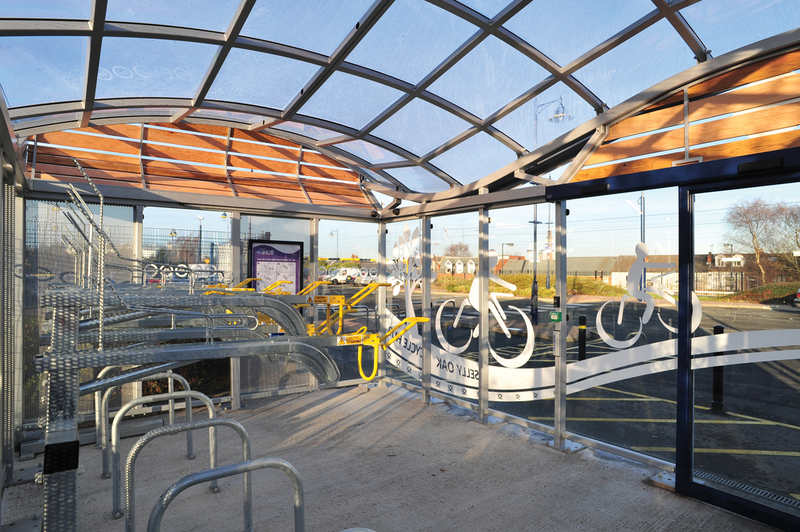 After numerous consultations with Centro and its stakeholders to ensure that the desired end result was achieved, a final design was agreed. 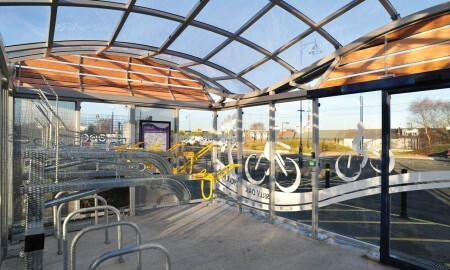 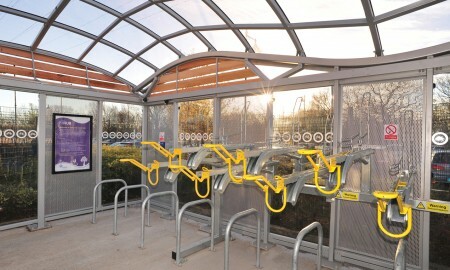 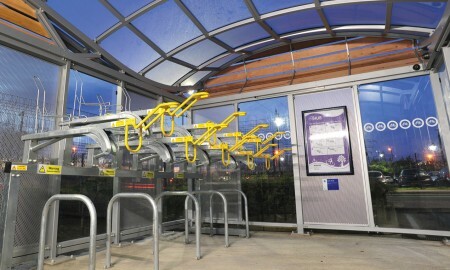 This included cycle parking spaces for 27 cycles consisting of two-tier cycle racks combined with Sheffield cycle stands. 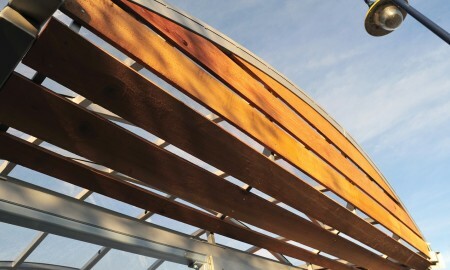 Broxap then set about constructing this grand structure. 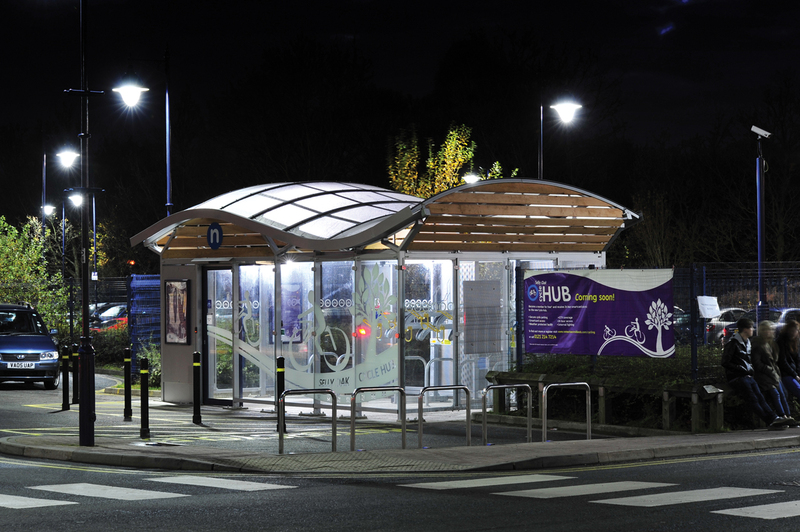 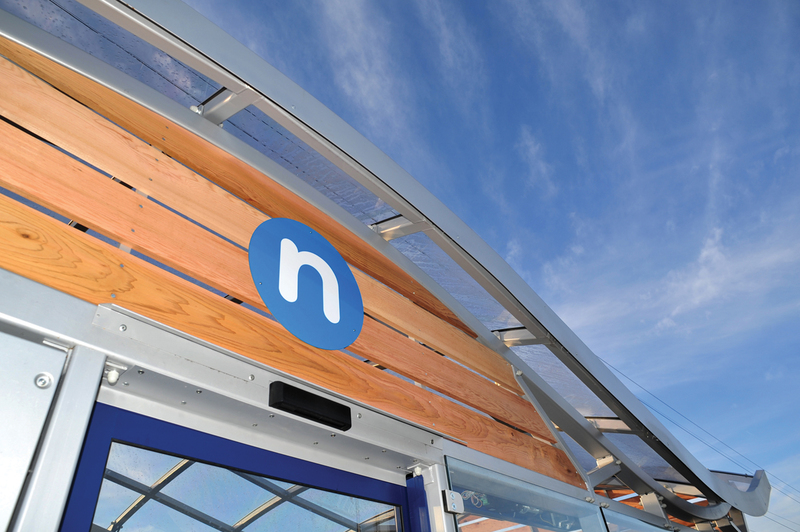 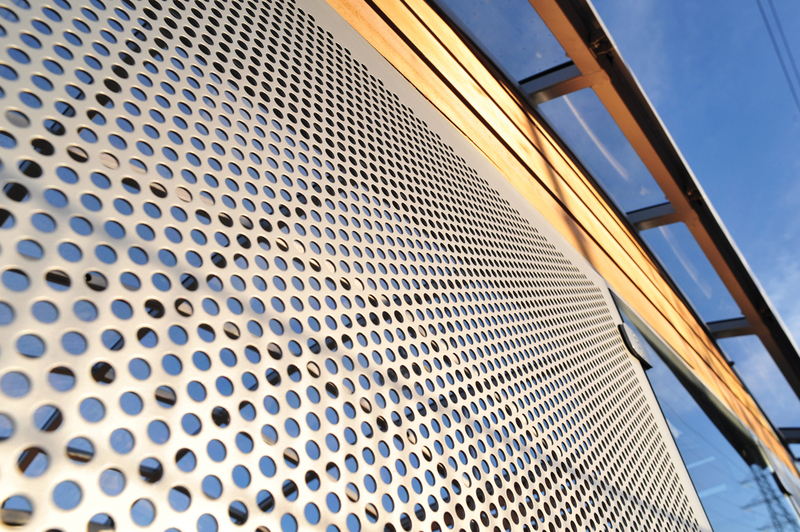 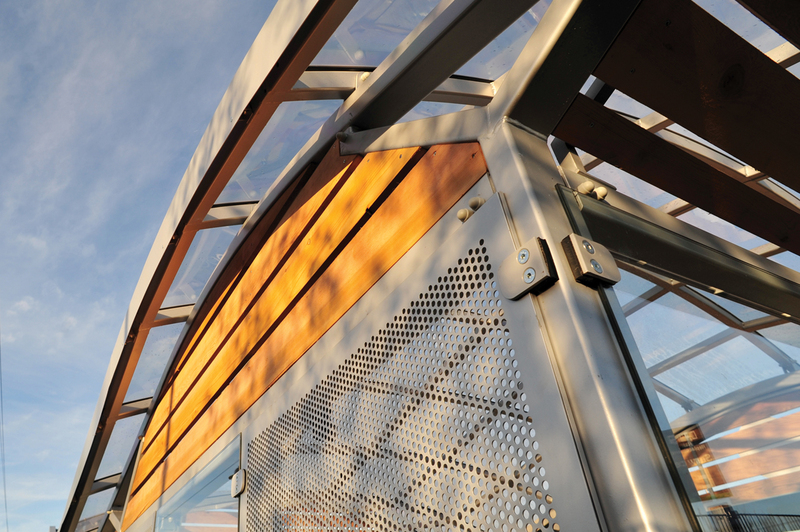 The hub itself is constructed from galvanised mild steel, P4A rated laminate glass with vinyl logos applied, perforated panels, timber slats and utilises state of the art automated doors with swipe card access. 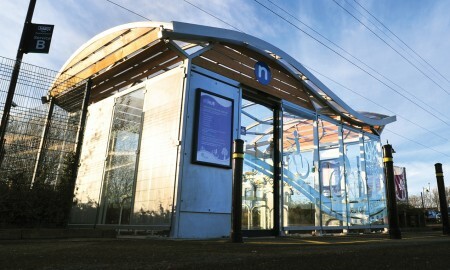 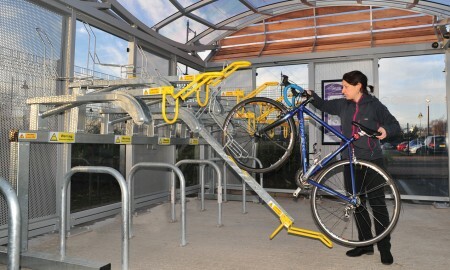 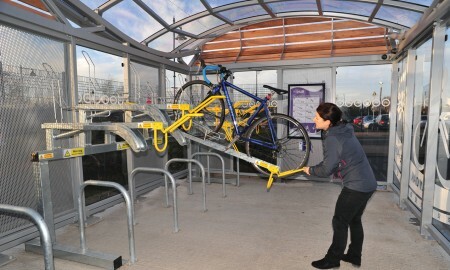 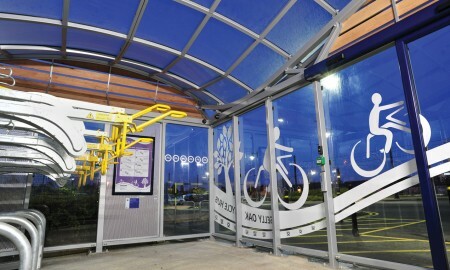 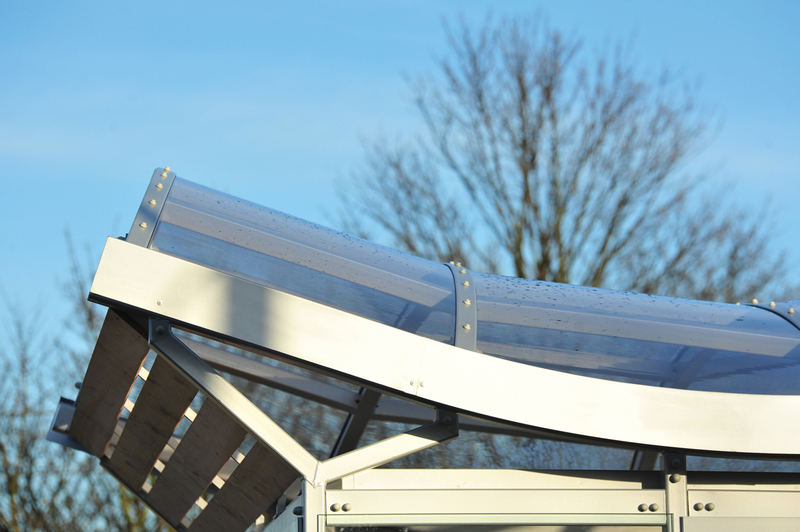 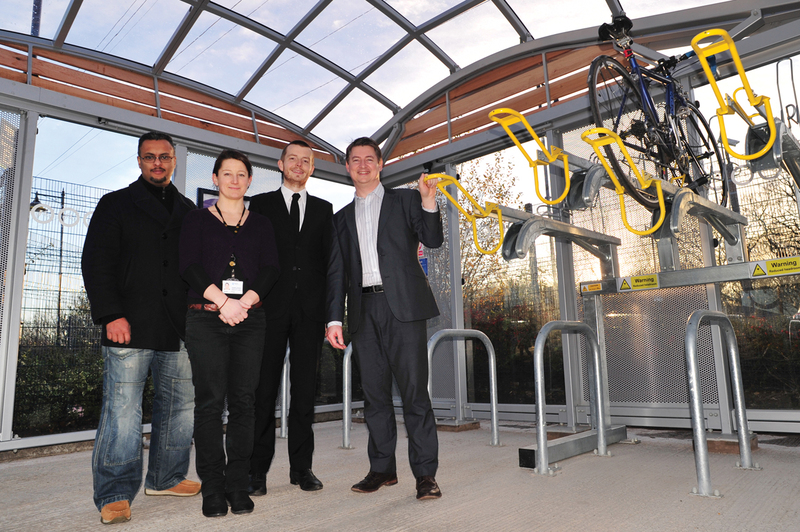 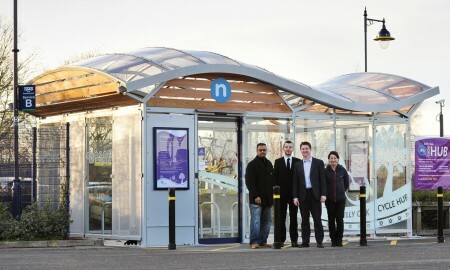 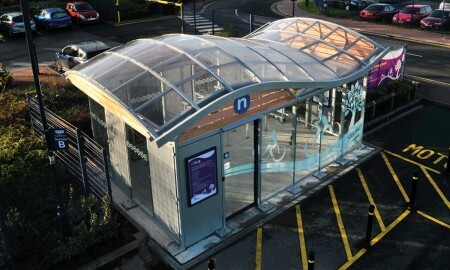 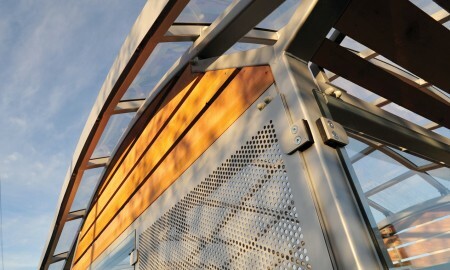 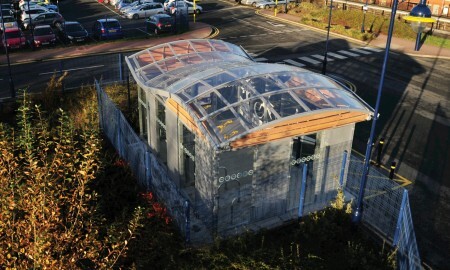 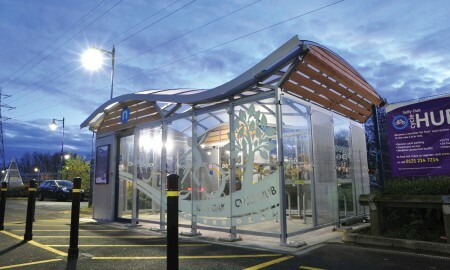 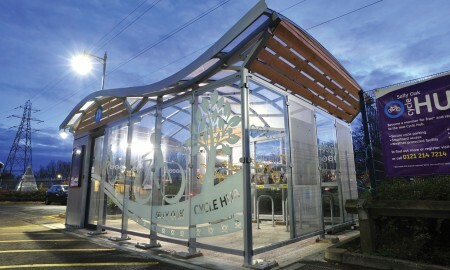 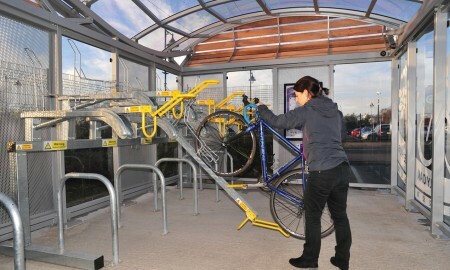 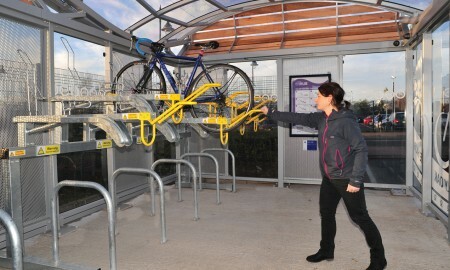 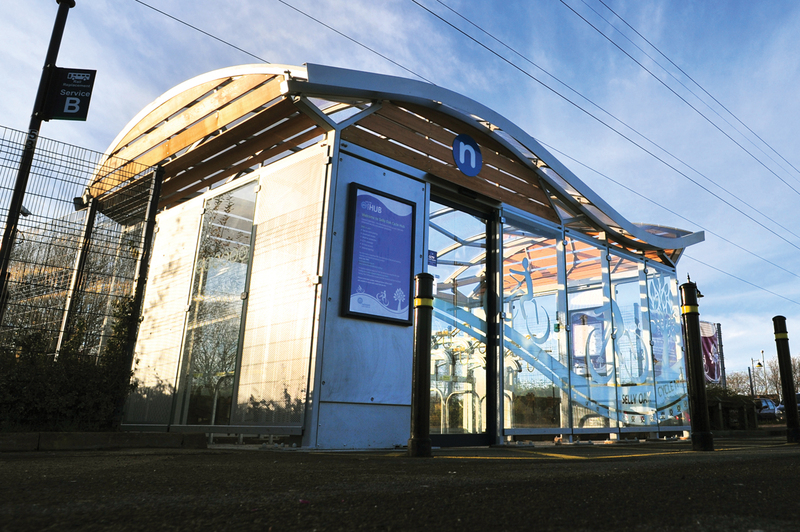 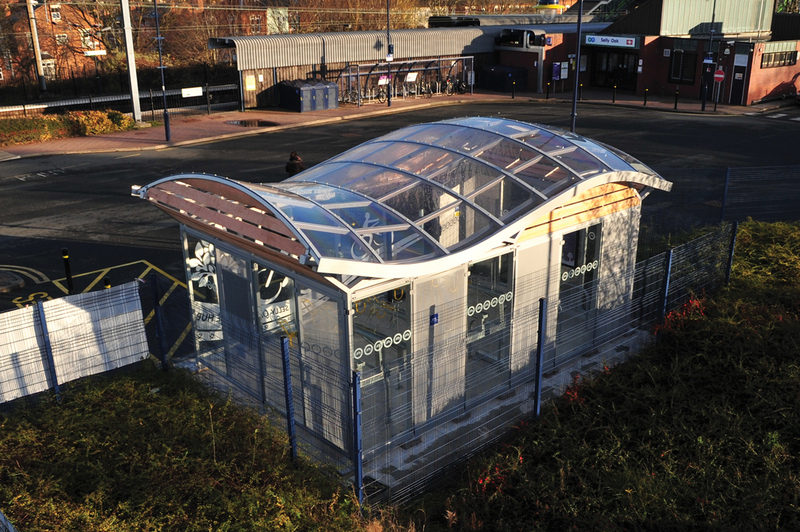 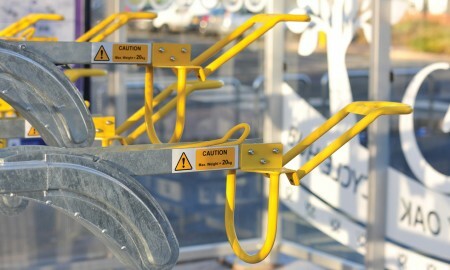 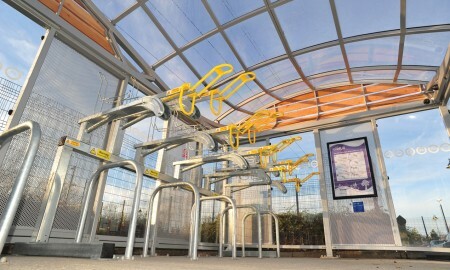 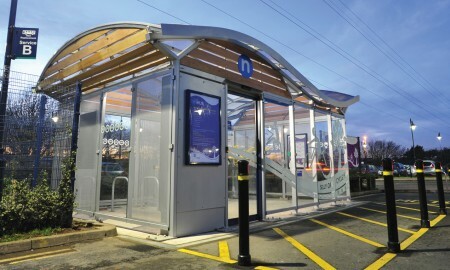 Selly Oak Cycle Hub is opened to the public in January 2014.